Did you know that the word nostalgia is a compound of two Greek words nóstos & álgos, referring to homecoming and ache? Now that 2016 is behind us, we’re experiencing a little homesickness and relief for another year gone by. At B&H we take comfort in the events of our past, the personal ties and threads connecting them at this little corner of Ballard. Smell and touch happen to be key factors of evoking such emotions so it’s no wonder we are warm and fuzzy with a pinch of melancholy just thinking about 2016. Nostalgia for the last year, or three, helps carbonate my personal and professional life in way that provides texture, connection, and gives me inspiration to keep moving forward. In an industry that breeds newness and change, our memories are among some of the gatekeepers to our development and evolution. Can our past predict our future? Some dear friends are investors with a team of us that own the real estate the restaurant sits on. One night Ryan and his family came in for dinner and introduced the restaurant to his mom & dad. Within earshot, his mom said “you know your great grandfather owned a grocery store somewhere in Ballard.” Instantly I got chills knowing that somewhere in the history of our building was a grocery store. What were the chances, that unbeknownst to Ryan, he bought into the real estate that once belonged to his family? As it turns out, the nostalgia must have been flowing pretty good to have his mom say something and was able to dig up this amazing relic. Ryan’s great grandfather George Leu is the one pictured in front of the very door you walk through on any given day or night and we are reminded of how powerfully connected our past and present can be. One of the biggest developments for the year was the spring arrival of brunch. Adding mornings to our routine meant seeing the space in a new light, welcoming more families to dine, expanding our amazing crew, and letting Mike’s expression of flavors explore different ingredients. One of my favorite dishes from the year happens to be on the brunch menu and has been receiving praise and adoration ever since our launch. At the height of summer, bartender Nick Baralow and I embarked on the fantasy of aged eggnog. A crazy idea to mix alcohol, sugar, eggs, cream, and spices 5 months before we were to drink it. Would this be genius or devastating? Only time would tell. We didn’t know what to expect as this was our maiden batch. How small? How large? Would anyone like it? Lessons learned: You loved it. Make more! As summer turned into fall, Brian Hibbard joined the restaurant as our new bar manager. 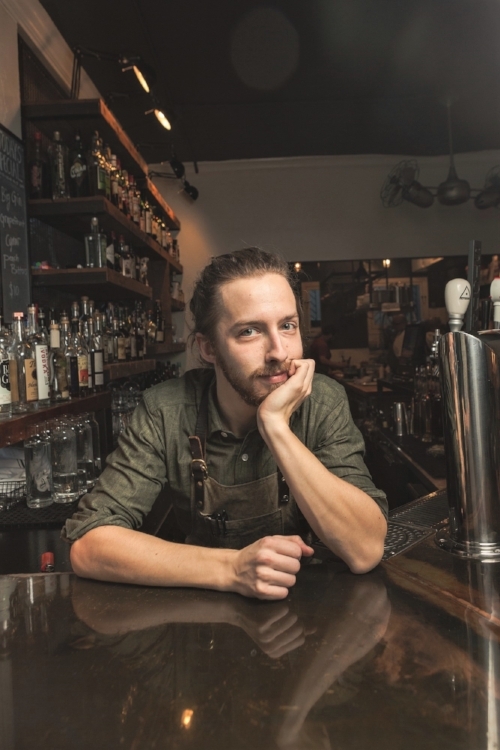 He was far and away the obvious choice because of his genuine care for fostering relationships and his innate ability to pair cocktails with Chef’s menu of bold flavors. One of my personal favorites of his, is the Market Drop Kick. Combining Brandy, Ramazzotti, Campari and Curacao, this is a big drink - hence Drop Kick - that lingers in a way that will bring up several different flavors while you enjoy it. Allspice hits your nose right from the get go, and serving the cocktail over a large ice cube allows the flavors to meld and come through more and more as the ice slowly melts. Our recognition in the media has been significant this year and I couldn’t be more proud of our team. We were super excited to discover that we made Food & Wine’s “Best Bars in America”! We also made appearances in Seattle Weekly’s “Favorite Restaurants”, Seattle Met’s “Seattle’s Very Best 100 Restaurants”, Eater Seattle’s Top 38 Restaurants, and multiple mentions in other publications including Seattle Magazine. Media backing or not, you are the reason we are still here and striving for greatness every day. This coming January 15th we will officially celebrate our third year and you. We will have a special throwback menu with some of our favorite dishes. It’s really insane to think about growing up but I hear that part is optional. The growing older part is mandatory. Each year we work to support the community through the creation and sale of limited edition commemorative anniversary prints, signed by the artists, to benefit a local charity. We are dedicated to raising awareness about vital work being done on a local level, and raising funds for Seattle-based nonprofits. This year we teamed up with Patrick Nguyen or artist name Dozfy. One night he was in having dinner with his wife and simultaneously drawing/painting on the menus. The entire team was blown away and soon discovered that his m.o. is going to restaurants and leaving behind this incredibly beautiful souvenir. You can find him on Instagram by his artist name and see for yourself or check out his poster design below. Net proceeds for this year's poster benefit Arts Corps, a local arts education organization that is dedicated to developing creative habits of mind in young people with hands-on art classes in areas with little or no access, and predominantly children in low income communities of color. In 2012 Arts Corps was awarded the highest national honor by the White House, The National Arts & Humanities Youth Program Award. As we forecast and navigate the year ahead, I am comforted by the thought of seeing Sylvia, the crossing guard to Market Street on school days. The flock of kids that grow up before our very eyes. The details you share about your lives when you come in for a visit. The dogs that collect each night at our front door for their snack (Thanks Blue Dog Bakery). And the countless hugs we received from you and first time guests. You're a special bunch and I am honored that we have a place people can gather.